Christian Church Ephesians 3:2-3 “ If ye have heard of the dispensation of the grace of God which is given me to you-ward: How that by revelation he made. 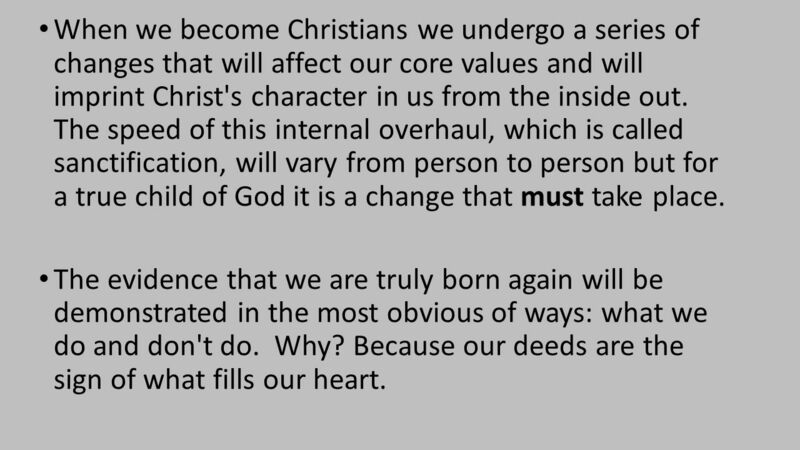 3 When we become Christians we undergo a series of changes that will affect our core values and will imprint Christ's character in us from the inside out. The speed of this internal overhaul, which is called sanctification, will vary from person to person but for a true child of God it is a change that must take place. The evidence that we are truly born again will be demonstrated in the most obvious of ways: what we do and don't do. Why? Because our deeds are the sign of what fills our heart. 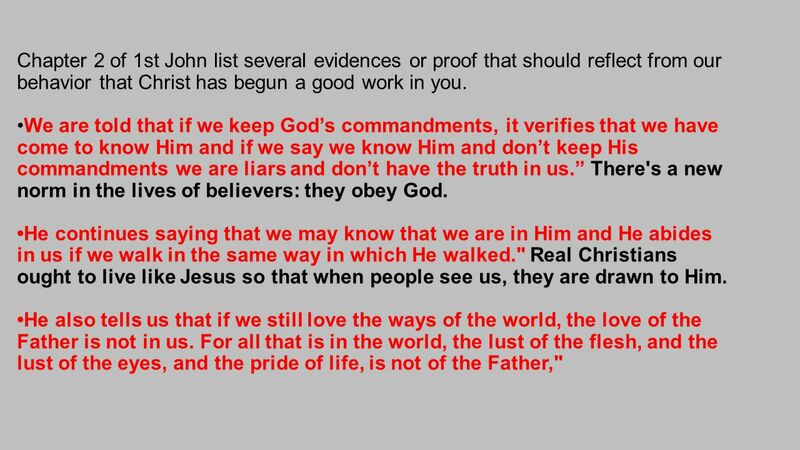 4 Chapter 2 of 1st John list several evidences or proof that should reflect from our behavior that Christ has begun a good work in you.We are told that if we keep God’s commandments, it verifies that we have come to know Him and if we say we know Him and don’t keep His commandments we are liars and don’t have the truth in us.” There's a new norm in the lives of believers: they obey God. He continues saying that we may know that we are in Him and He abides in us if we walk in the same way in which He walked." Real Christians ought to live like Jesus so that when people see us, they are drawn to Him. He also tells us that if we still love the ways of the world, the love of the Father is not in us. For all that is in the world, the lust of the flesh, and the lust of the eyes, and the pride of life, is not of the Father,"
5 Scripture: Ephesians 4:17-24 This I say therefore, and testify in the Lord, that ye henceforth walk not as other Gentiles walk, in the vanity of their mind, (18) Having the understanding darkened, being alienated from the life of God through the ignorance that is in them, because of the blindness of their heart: (19) Who being past feeling have given themselves over unto lasciviousness, to work all uncleanness with greediness. (20) But ye have not so learned Christ; (21) If so be that ye have heard him, and have been taught by him, as the truth is in Jesus: (22) That ye put off concerning the former conversation the old man, which is corrupt according to the deceitful lusts; (23) And be renewed in the spirit of your mind; (24) And that ye put on the new man, which after God is created in righteousness and true holiness. 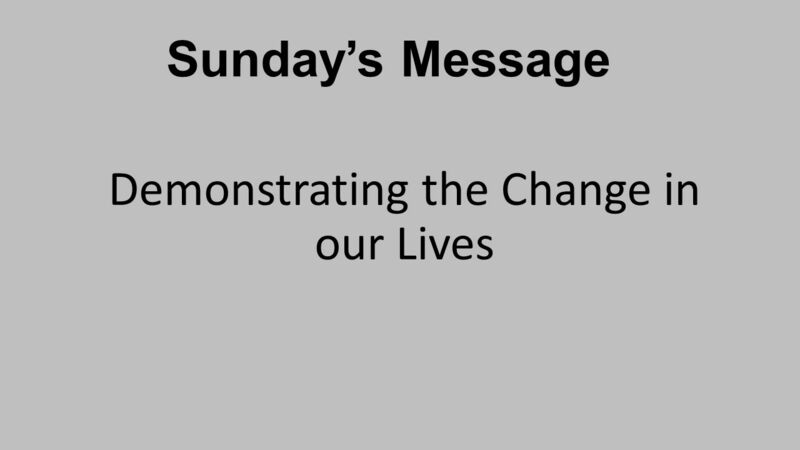 6 There were Four key points identified in the message that we desire to make available for roasting this week. I. 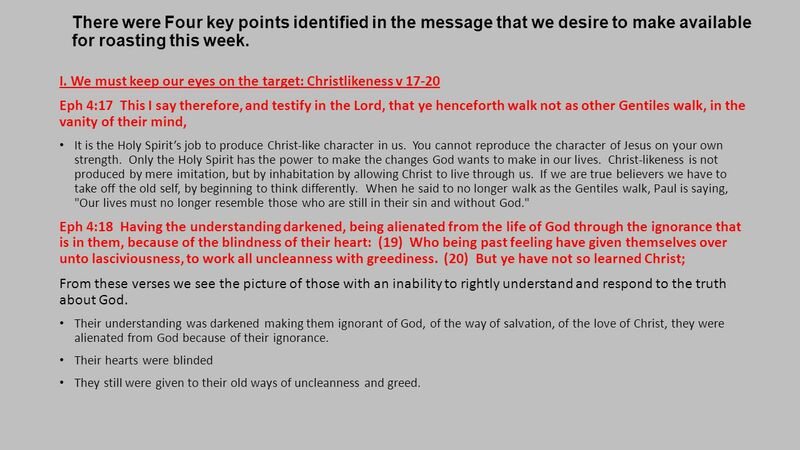 We must keep our eyes on the target: Christlikeness v 17-20 Eph 4:17 This I say therefore, and testify in the Lord, that ye henceforth walk not as other Gentiles walk, in the vanity of their mind, It is the Holy Spirit’s job to produce Christ-like character in us. You cannot reproduce the character of Jesus on your own strength. Only the Holy Spirit has the power to make the changes God wants to make in our lives. Christ-likeness is not produced by mere imitation, but by inhabitation by allowing Christ to live through us. If we are true believers we have to take off the old self, by beginning to think differently. When he said to no longer walk as the Gentiles walk, Paul is saying, "Our lives must no longer resemble those who are still in their sin and without God." Eph 4:18 Having the understanding darkened, being alienated from the life of God through the ignorance that is in them, because of the blindness of their heart: (19) Who being past feeling have given themselves over unto lasciviousness, to work all uncleanness with greediness. (20) But ye have not so learned Christ; From these verses we see the picture of those with an inability to rightly understand and respond to the truth about God. Their understanding was darkened making them ignorant of God, of the way of salvation, of the love of Christ, they were alienated from God because of their ignorance. Their hearts were blinded They still were given to their old ways of uncleanness and greed. 7 II. 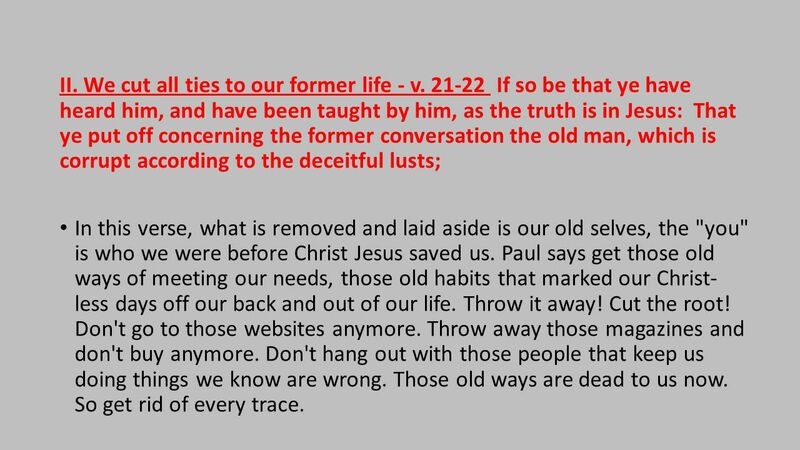 We cut all ties to our former life - v. 21-22 If so be that ye have heard him, and have been taught by him, as the truth is in Jesus: That ye put off concerning the former conversation the old man, which is corrupt according to the deceitful lusts; In this verse, what is removed and laid aside is our old selves, the "you" is who we were before Christ Jesus saved us. Paul says get those old ways of meeting our needs, those old habits that marked our Christ- less days off our back and out of our life. Throw it away! Cut the root! Don't go to those websites anymore. Throw away those magazines and don't buy anymore. Don't hang out with those people that keep us doing things we know are wrong. Those old ways are dead to us now. So get rid of every trace. 8 III. 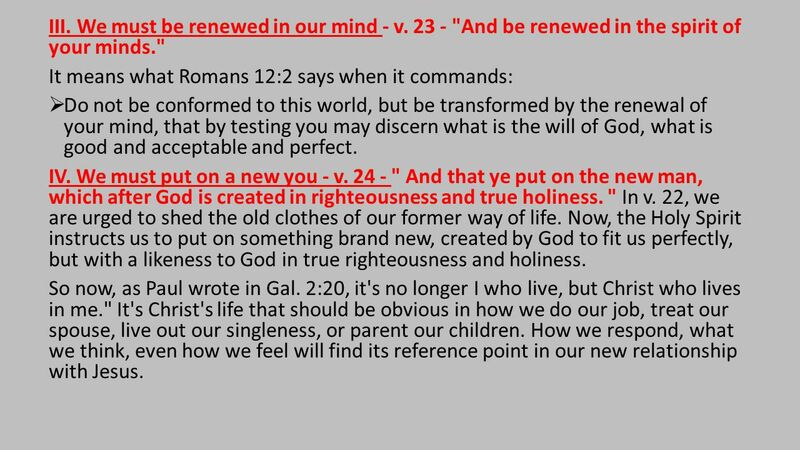 We must be renewed in our mind - v. 23 - "And be renewed in the spirit of your minds." It means what Romans 12:2 says when it commands:  Do not be conformed to this world, but be transformed by the renewal of your mind, that by testing you may discern what is the will of God, what is good and acceptable and perfect. IV. We must put on a new you - v. 24 - " And that ye put on the new man, which after God is created in righteousness and true holiness. " In v. 22, we are urged to shed the old clothes of our former way of life. Now, the Holy Spirit instructs us to put on something brand new, created by God to fit us perfectly, but with a likeness to God in true righteousness and holiness. So now, as Paul wrote in Gal. 2:20, it's no longer I who live, but Christ who lives in me." It's Christ's life that should be obvious in how we do our job, treat our spouse, live out our singleness, or parent our children. How we respond, what we think, even how we feel will find its reference point in our new relationship with Jesus. 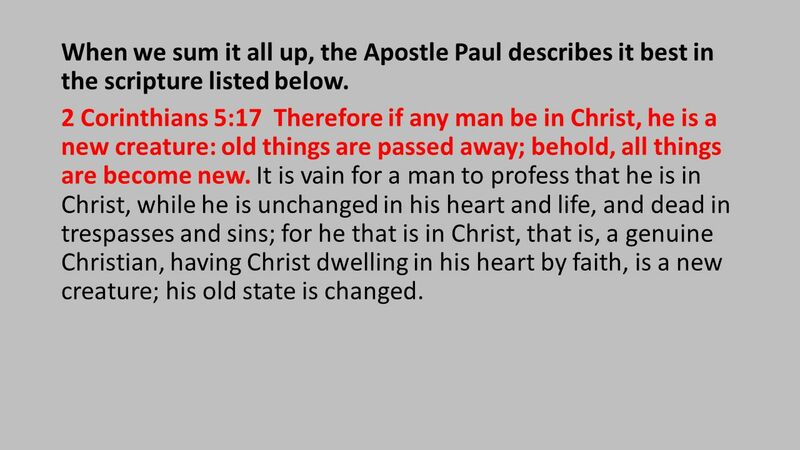 9 When we sum it all up, the Apostle Paul describes it best in the scripture listed below. 2 Corinthians 5:17 Therefore if any man be in Christ, he is a new creature: old things are passed away; behold, all things are become new. It is vain for a man to profess that he is in Christ, while he is unchanged in his heart and life, and dead in trespasses and sins; for he that is in Christ, that is, a genuine Christian, having Christ dwelling in his heart by faith, is a new creature; his old state is changed. Download ppt "Christian Church Ephesians 3:2-3 “ If ye have heard of the dispensation of the grace of God which is given me to you-ward: How that by revelation he made." Because We Were Baptized The Scriptures Plainly Teach That: In Baptism the Penitent Believer Receives Remission of Sins. (Acts 2:38) In Baptism the Penitent. Some Negatives in the Mature Christian Ephesians 4:17-32 This I say, therefore, and testify in the Lord, that you should no longer walk as the rest of. Stop thinking like children. In regard to evil be infants, but in your thinking be adults. but in your thinking be adults. I Corinthians 14:20. A Holistic Path Ephesians 4:17-32 Peter Fitch Sunday, March 7, 2010. 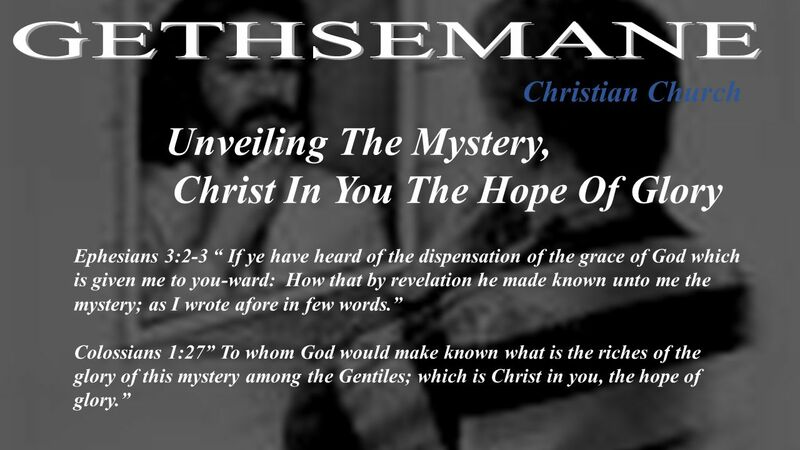 The Epistle to the Ephesians A History Lesson—Ephesians 4:21-24 We ended the last lesson with: Paul had given us a brief yet complete sketch of the old. FOLLOWERS OF GOD Ephesians 5:1-2. The Character of Sinners  Eph 4:17-19 – This I say, therefore, and testify in the Lord, that you should no longer walk. Truth, Judgment and Eternity Ephesians 4: Overview of Chapter 4:17-24 God’s Image Bearers vv – v17 Not to live like the heathen – v18 The. FIRSTBORN. First — Natural Second — Spiritual God’s Promises to Abraham Great Nation Great Nation Inheritance Inheritance All Nations Blessed All Nations. NOR GIVE PLACE TO THE DEVIL Ephesians 4:27. WE ARE AT WAR The enemy is real. Ephesians 6:11-12, 1 Peter 5:8 The enemy is real. Ephesians 6:11-12, 1 Peter.